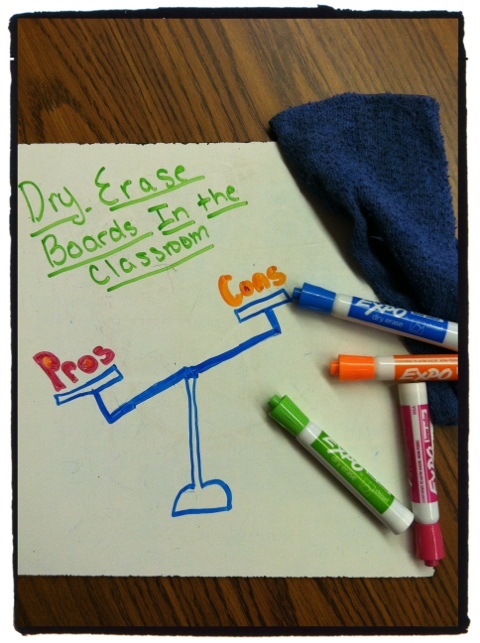 One of the learning tools I love to use the most is also one of my students’ favorites: dry erase boards. Three years ago I bought a large 4′ x 8′ sheet of hardboard at Lowe’s for around $11.00. For a minimal fee they cut the board into 32 12″x 12″ boards. I think the total bill was less than $15.00. I purchased economy packs of wash cloths at Dollar General. While dry erase markers can be pricey, our team has them on the supply list (1 pack of 4 for each student). We put these markers in a huge basket and they are for general use in the classroom. We use these boards almost every day in some capacity. I have my students write an occasional short answer/extended response/journal entry on a dry erase board. I love when students ask if they can get another board because they don’t have room for everything they want to say. I use them with our online textbook. It’s not very easy to get computer time in our building but by using the SMART Board and the dry erase markers, I can easily use tutorials, review activities, and vocabulary lessons with the whole class. Dry erase boards are also a great way to do formative assessment. It’s very easy to get an overview of how well the students grasped the daily lesson. The pros clearly outweigh the cons.